Girls Exploring Science and Technology (G.E.S.T.) is a one-day event held at the Duke University Marine Laboratory in Beaufort, NC to help expose middle school girls (6-8 grades) to the idea of pursuing a career in science. 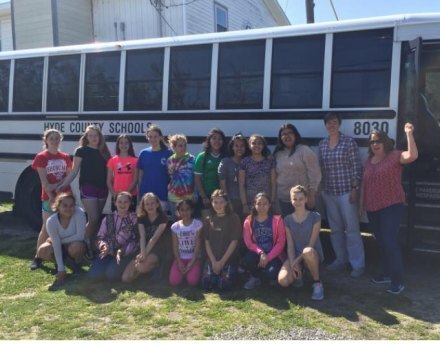 Ocracoke middle school girls got the amazing chance to go for a second time this year. Sixteen middle school girls went to G.E.S.T. with chaperones Mary McKnight and Laura McClain. Last year we were exposed to this wonderful program and each of us enjoyed the event so much that we decided we wanted to go again the next year. So when April 13th rolled around we hopped on the 4 o'clock Cedar Island and headed for our hotel. We all had so much fun hanging out at the hotel and some of us took a dip in the pool, including me, and just let me say it was not the wisest Idea we've ever had because it was freezing outside. Despite the coldness at night, it was really nice and warm during the day. The next morning, April 14th, we got up early to headed to the event where we explored the library where they had a live owl. We all sat back and listened to the opening keynote speaker and presentation before meeting with our assigned groups for some icebreaker challenges. The program had a variety of activities including water bottle rockets, squid dissection, and aquatic animal vet care. All of us participated in three activities with our groups, making a few friends along the way. At lunch we decided play a basketball game with some of the other girls and – shocker – 6th grader Maren Donlen was in the middle of the whole thing. After we finished the program we hopped back on the ferry and headed home. I think GEST is an amazing opportunity for the girls of Ocracoke School and I am very sad to say that next year will be my last year I am able to attend, but I hope future middle school girls will continue to attend the program. Thank you to all the volunteers and Ms. Mary for driving the bus. I hope to see more girls going next year. Girls Rule!